Right then and there, I just knew that I had to visit this town and see its impressive beauty for myself! And once I did see its entirety with my own two eyes… I wasn’t disappointed at all. It was exactly how I imagined it to be — charming and picturesque, no matter how small of a town it is. Located in the French-speaking region of Belgium in the south (Wallonia), Dinant is a municipality in Namur that’s located on the River Meuse. It has an area of around 90 km2 which is somehow huge; BUT the main town itself is quite small and can be walked in whole within just less than an hour! TRIVIA: In the past, due to its strategic location on the Meuse, Dinant was often exposed to battle and pillage so it naturally follows that this area is quite packed with history and fortresses. The River Meuse is a major European river that rises from France, flowing through Belgium and the Netherlands until it trickles into the North Sea. So given how Dinant ‘sparkles’ along this river body, it’s a must to bask in its beauty! You can choose to walk or lounge beside the Meuse, or you can enjoy a cruise to take in all of the breathtaking scenery. For rates and availability, it’s best to check Evasion.be for more information. We visited here this November and the cruises weren’t in season (as they’re typically available during April and October); but it was fine, since we already enjoyed walking by the riverside. Besides, it was also too cold and I don’t think I would have enjoyed a river cruise if there was one at the time. 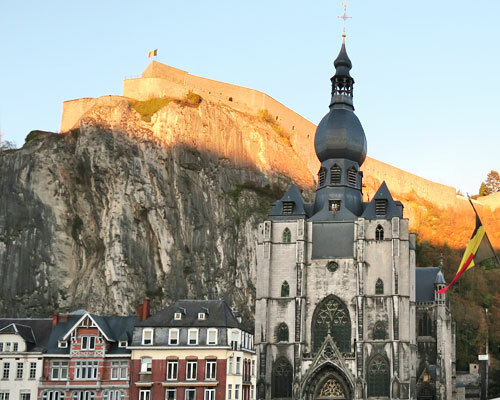 Said to be the landmark of Dinant, this Collegiate Church of Our Lady is a 13th-century Gothic cathedral which has an iconic 16th-century pear-shaped bell tower. It’s truly a lovely structure in itself that’s even perfectly backdropped by the cliff behind it where the town’s citadel sits. Built in 1815, this fortress overlooks the city of Dinant and is part of the so-called ‘Meuse Citadels’ (with the two others located in Huy and Namur). To go up this cultural hotspot, you can either walk up the 405 steps or take the cable car that costs around 11 EUR. It’s well worth your time to visit this place since it does not only have an Arms Museum but it will also reward you with a great aerial view of Dinant! The main bridge in Dinant is called as ‘Charles De Gaulle’ to commemorate of the presence of Charles de Gaulle himself — a previous president of the French Republic — when he was shot in the leg during the major battle in Dinant back in August 1914. Last 2014 which was the 100th anniversary of World War I, they have put up a statue of Charles at the foot of the bridge as a way of celebrating their association with him (which is somehow ironic and odd). Speaking of Adolphe Sax, even if he had only lived in this town for a year before his family moved to Brussels and then to Paris, Dinant didn’t want to miss the opportunity of claiming him as their “son” and even celebrating his achievements with such gusto! TIP: If you want to have an interactive musical experience, head on to the Maison de la Pataphonie (House of Pataphony) located in the street of Rue En Rhee – 51. It’s a 15th-century hosue that’s been renovated into a series of rooms wherein you can play with the instruments that are made of household items! Well of course, since we’re in Belgium, there has to be a musuem somewhere that’s dedicated to beer, and it is here in Maison Leffe that you can have the chance to take in the history of how Leffe was made — which is one of the most-known Belgian Trappist beers. In this hotel-slash-museum, you can do a self-guided tour that will show you the beer-making process and the life of a Trappist Monk. To finish up the 7 EUR entrance fee, you will also get to have a bear-tasting spree and a gift as well! Located between Dinant and Anseremme, the Bayard Rock is a spectacular rocky needle that is about 40 meters high and this… was quite a sight! Legend has it that it was formed when it was split by the hoof of Bayard, a giant magical horse that carried the 4 sons of Aymon (an ancient epic). …In reality however, there used to be a small hole in between these rocks and it was split open by the soldiers of Louis XIV when they were trying to invade Dinant. Now of course, since we’re in the south of Belgium (that’s more hilly and speckled with more lush forests) you must not miss out on the outdoor adventures that are available. Besides, if you go down near Anseremme, you will find a lot of providers that offer nature walks, kayaking, cross country cycling, ziplines, rock climbing, and more! Jonas and I, however, took it upon ourselves to try two things given the time that we have: cave exploration and hiking. There are several caves and hiking trails in the area to choose from, and since we are the kind of couple that’s into random and spontaneous activities, we ended up exploring Grotte de Dinant (as it was the first that we saw) and a random hiking trail somewhere near Anseremme. End result: it was amazing. We loved the limestone formations in the cave of Grotte de Dinant and our random hiking trail had even led us to great spots that are clad with stunning cliffs and colorful autumn trees. To get a better glimpse of our adventure, come watch my vlog below! The bathtubs are often decorated in line with the year’s theme and it’s really wacky. Unfortunately, we didn’t manage to see this event since it was only held during the 15th of August. With that in mind, you bet that I will be scheduling my attendance for next year! Couque de Dinant: a sweet biscuit that’s native to Dinant, and apparently, this is Europe’s hardest biscuit! And boy, they were right! It leaves me to think that this is rather best for decoration than for eating… But when you do manage to dissolve and eat it (which I did) it’s quite good. Flamiche Dinantaise: This is much like the French quiche but here in Dinant, they make it with a special low-fat cheese called as Boulette de Romedenne. By train. 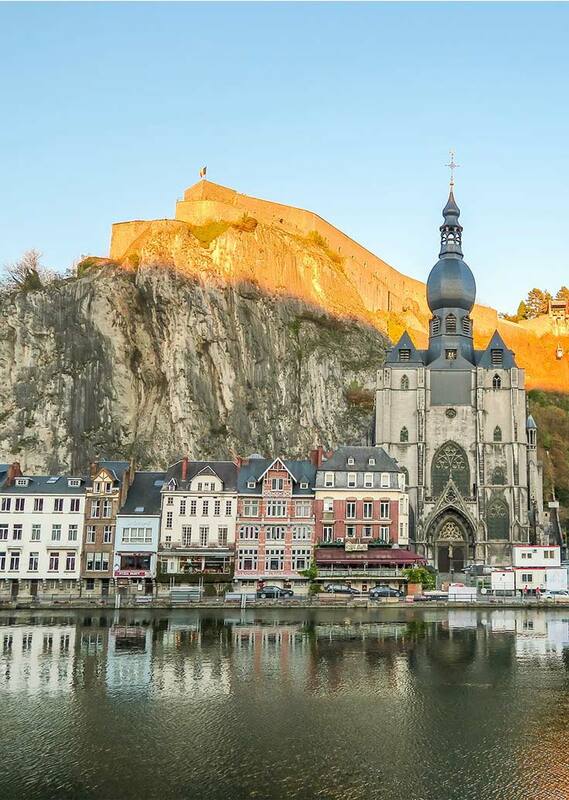 From either Namur or Brussels, you can easily reach Dinant in just 1.5 hours and the stop is conveniently located in the other side of the river which is just a 5-minute walk away from the city center. By car. This is how we got to Dinant, and thanks to Belgium’s excellent motorway system, it was easy to reach it by car. Just follow the A4 motorway and you will easily find signs that will lead you to Dinant. If you’re from Brussels, it will just be an hour’s drive away; but since we are currently based in Antwerp, it took us around 2 hours. By plane. The closest airports are Brussels, Charleroi (Brussels South Charleroi Airport) and Liège. NOTE: Once you’re in town, there’s no need to be concerned about getting around since as I’ve mentioned, Dinant is a very small (cute!) city. Though if you have to reach places like the Castle Freyr, you would have to ride the bus, or you can opt to walk too, but it would be like 6km away. Given the size of the town there are only around a handful of hotels in the city and what I would highly recommend is Ibis Hotel which is the highest-rated accommodation in Dinant. We stayed here during the duration of our trip and it was pleasant; I especially loved how it was located just by the river! For other choices, feel free to browse through Booking.com for the best price! Dinant may truly be a tiny city and municipality, but the beauty it holds can blow you away! That being said, this is definitely one of the hidden gems and best-kept secret of Belgium. Quaint and peaceful, this can be quite a serene getaway especially if you’re looking for some time away from big bustling cities. What do you think of Dinant? Would you like to visit this town? 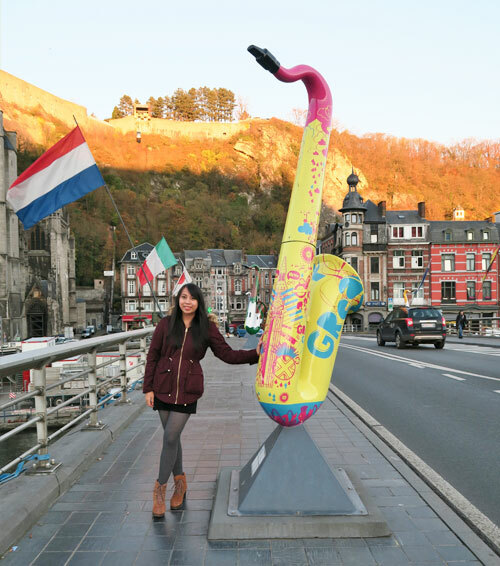 I stumbled upon Dinant when planning a trip thru Amsterdam, Netherlands and Mosel Valley. Loved the town, it was a perfect day trip which offered up a combination of natural beauty, architecture, history... oh and beer! Looks like you missed the fact that Leffe Beer was first produced there in the local Abbey in 1240. Wow, what a beautiful town and some amazing photos as well!! 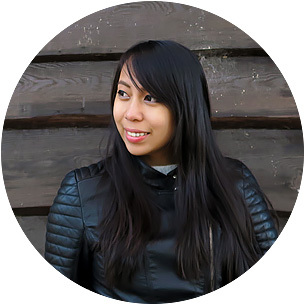 Hello Aileen I read about yours biography it interesting me I wish you best and success in yours life . Are you leaving in Dinant now? They really are! But beware, these kinds of cookies are actually very hard haha! They're the hardest in Europe! Dinant is truly a magnificent city. After spending time in Brussels, it is good to see some hills again. I was not as impressed with the state of roads in Belgium. If I knew about the mini Versailles before, my time in the area would be spent differently. True that! The south really is more hilly and I know what you mean about the roads in Belgium -- that's why there's a running joke that you'll instantly know if you're out of Belgium since the roads are better haha!